Once in awhile, a product comes along that not only performs amazingly well, but has such fantastically innovative packaging that you'd be a fool not to run out and buy it immediately. Such is the case with Benefit Thrrrob. The cheekily-named blush comes in a tiny box accented with a corseted ribbon design that just begs to be opened immediately. Now, Benefit Thrrrob is by no means a new product. 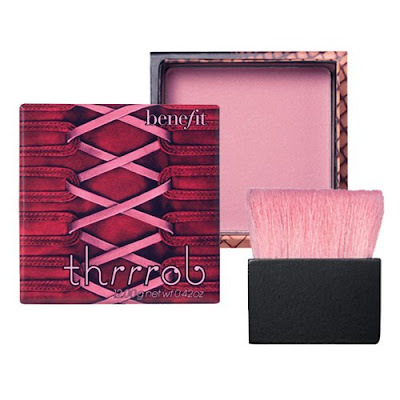 But considering I just made my first foray into the blush world within the last year -- with another Benefit product, coincidentally -- it's only natural that I would have just discovered Thrrrob's greatness. The bright pink shade inside the box may seem a bit scary at first. But it actually applies like a dream and just leaves such a gorgeous flush upon the skin. The accompanying brush has flat, smooth bristles that spread the powder evenly across your cheeks. I actually like to sweep it very lightly all over my face to give it a bright flush and subtle dose of sparkle. Benefit Thrrrob retails for $28 at benefitcosmetics.com.